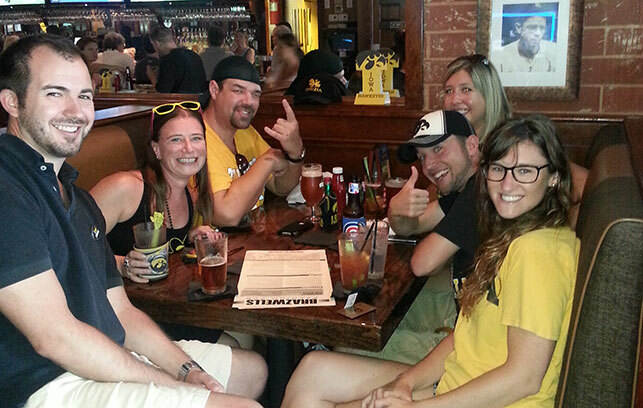 Here you will find all the information you need about the game watches, events, and everything else you need to stay in contact with your fellow University of Iowa Alums! Please take the time to join the Charlotte IOWA club. Members enjoy club events and merchandise. Membership makes it possible to put on events, keep our costs low, and fund the year. Please fill out a membership application. Please visit our Linkedin page to help expand your network, post job listings, and share information about yourself and your business. For more information on the club, to volunteer to help out the club, or to get added to our mailing list sent us an e-mail. Our game watch location for the 2018 season will be Brazwell’s Pub and Sports Bar! Brazwell’s is also supplying us with pork tenderloin sandwiches each week during the game. Known as the “Iowa Sandwich” they are available exclusively during Hawkeye game watches.